This is what happens when you make a cake and your family gets to it before you can take any pretty pictures of it. It was my Dad’s birthday on Saturday, and he requested a “rich decadent light coconut vanilla triple layer dooins”. Those were his exact words. He wanted it to be rich/decadent/light all at the same time. I supposed I succeeded at that. Everyone apparently loved it, so I guess that’s a thumbs up on my part right? I didn’t have any coconut extract, so I had to rely solely on actual real coconut things to make this cake taste like coconut. I used the usual white velvet cake recipe I usually do, but in place of the butter and milk I used coconut oil and coconut milk. I also added about a cup of large flake coconut into the batter. Omnomnom! 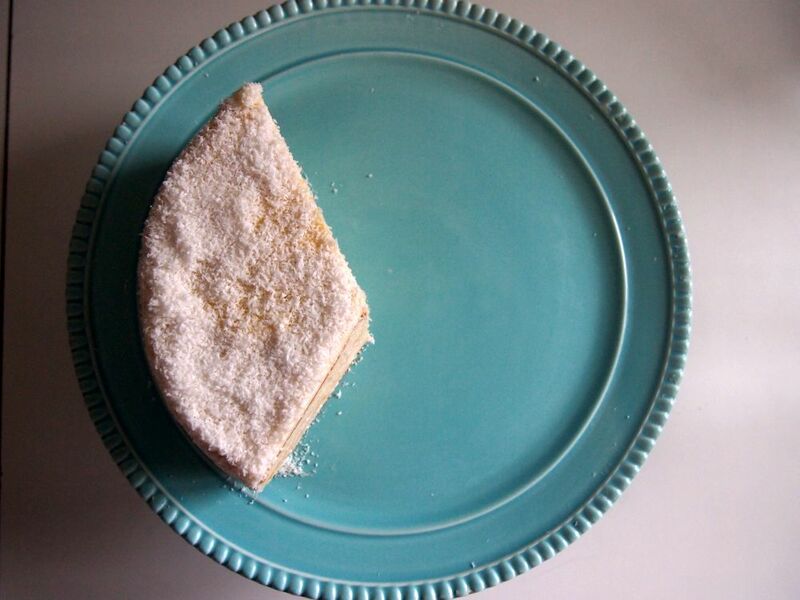 It definitely changed the texture of the cake a little bit, it wasn’t as light and airy and the crumb wasn’t as tender as normal, but it did taste like coconut and was still really good. Aww yeaaah. I filled it with a regular old vanilla pastry cream, which I made with coconut milk instead of regular milk, and lightened it with a ginger whipped cream I had left-over from a dessert I made on Saturday night (sorry, no blog post on that since it was A TOTAL FAIL haha oh man you should’ve seen it. I was terrible. I managed to salvage it somehow and we still ate it and it was kind of tasty). It felt like the ginger in the cream really enhanced the coconut flavour overall. Tasty! I just used a regular old french buttercream to mask the cake, and covered the whole thing in unsweetened macaroon coconut. 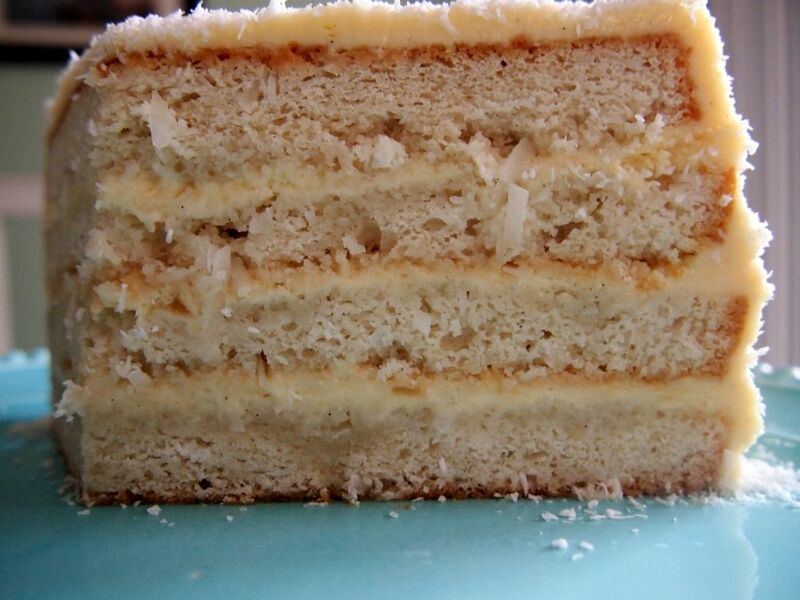 The cake layers I soaked with a simple syrup that I added some coconut rum to. That really helped the delicious coconut taste. Oops you can see the cake layers..haha. My bad! But look at how pretty that stand is. I have a thing for cake stands. I love this one in particular right now. B-e-a-utiful! Preheat oven to 350F and grease and set aside two 8″ cake pans. Mix together the milk, whites, vanilla, and rum. Set aside. Combine the flour, sugar, baking powder, salt and coconut oil in a mixing bowl until the oil has been broken up into tiny bits. Add about 3/4 cup of the liquid and mix until combined. Whip on medium speed until light and fluffy, for about 2 minutes. Scrape down the sides of the bowl and then slowly pour in the liquid until all combined. Scrape down the sides of the bowl, and beat for a few more seconds until beautifully homogeneous. Fold in the flaked coconut. Divide the cake batter between the pans and bake for 30-35 minutes until it springs back when lightly touched and a toothpick inserted in the centre comes out clean. Allow to cool fully! Boil everything together just until the sugar is dissolved. Cool before brushing onto split cake layers. 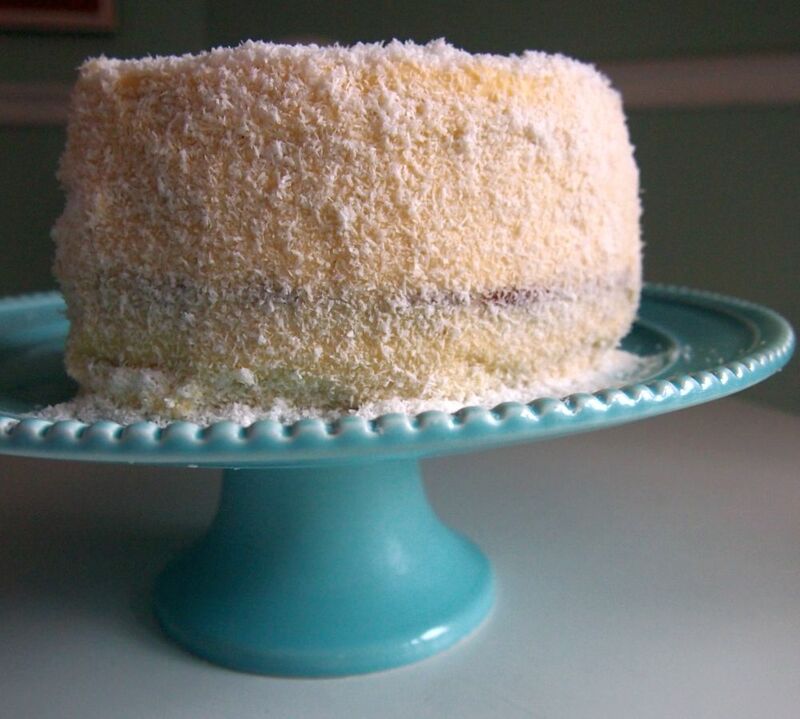 This entry was posted in Cake and tagged bake all day erry day, baking, cake, coconut, coconut cake, white velvet cake. Bookmark the permalink.